DRIVING RAIN rarely gets in the way of any Shetlander – let alone a squad of hardy Vikings. Guizer jarl Stewart Jamieson’s band of merry men encountered the elements head on as his squad kicked off Lerwick Up Helly Aa early on Tuesday morning. It will have led to some excitedly conjuring up the line ‘weather didn’t dampen the spirits’ in their head, unaware of the well-worn cliche being used no doubt thousands of times for Up Helly Aa by now. The day started off at around 8.30am with a hearty breakfast to line the stomach for the many drams likely to be imbibed over the next 24 hours. It was on to the Lerwick Legion for a pit stop and a chance to mingle with family and friends before the squad of over 60 men and boys hit the streets to head to downtown Lerwick. Among the surprises was a banner held aloft outside Harry’s Department Store – the shop Stewart, or Thorvald Thorvaldsson as he is known this week, runs in the footsteps of his late father. It wasn’t quite a message of support though, with the cheeky sign proclaiming that there will be 75 per cent off of all stock today and Wednesday – while there were also banners held in support of giant retailers like Tesco and Amazon. “Three cheers for Westside Pine!” Stewart also roared as he stood outside the neighbouring business, with tourists no doubt by this stage a little unsure as to just what was going on. There was indeed an international flavour with the thousands of onlookers, with people travelling from all over the globe to witness the event. Following a photo session with the Blaze Away galley at Albert Wharf, it was on to the Town Hall for the traditional civic reception. The great and good of Shetland life were in attendance, from MP Alistair Carmichael and council leaders to the police and sheriff Philip Mann, who will likely have attended his last reception before he steps down from his role in early February. 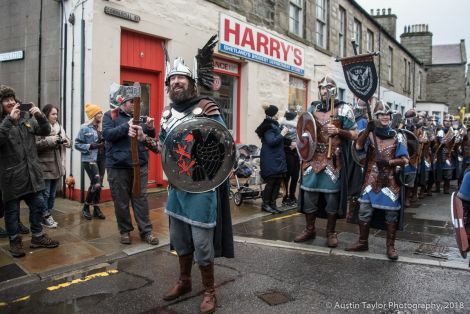 Whisky was dished out to those who enjoy a pre-midday tipple before the jarl squad ran through their song repertoire, which included an Up Helly Aa version of Black Eyed Peas’ I Gotta Feeling and Status Quo’s Rockin’ All Over The World. Shetland Islands Council convener Malcolm Bell said it was a “pleasure and a privilege” to be hosting the event at ‘Lerwick Town Hall’ – a nod to recent confusion over the name of the historic building. The Lerwick North councillor used his speech to joke about Flybe’s withdrawal from competing against Loganair on flights to and from Shetland by quipping that the local authority would be launching its own airline – the unfortunately named ‘Air SIC’. 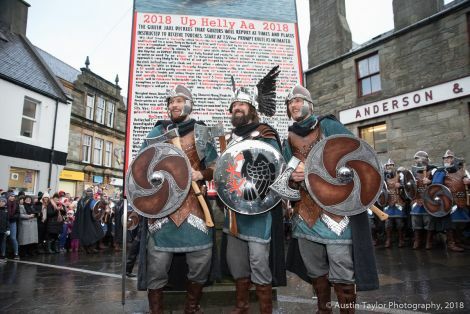 Bell paid tribute to those who had travelled for Up Helly Aa, including staff from Panasonic in Japan who are filming the event, as well as far-flung members of the jarl squad who came from the likes of Australia and New Zealand. “Not forgetting Andrew Irvine, all the way from Whalsay,” he joked. The convener also acknowledged Stewart’s dad Harry, who will “be here in spirit”. “Harry would have wanted this to be the best party ever,” he said. 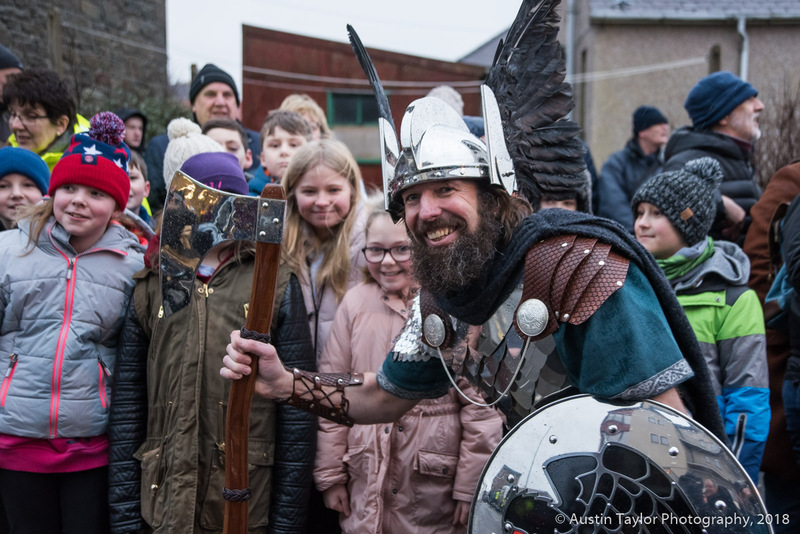 Bell said he was disappointed there was no real dirt to dig Stewart for his speech and joked that he would “campaign for the return of the outrageous guizer jarl” to ensure he had jibes for future years. 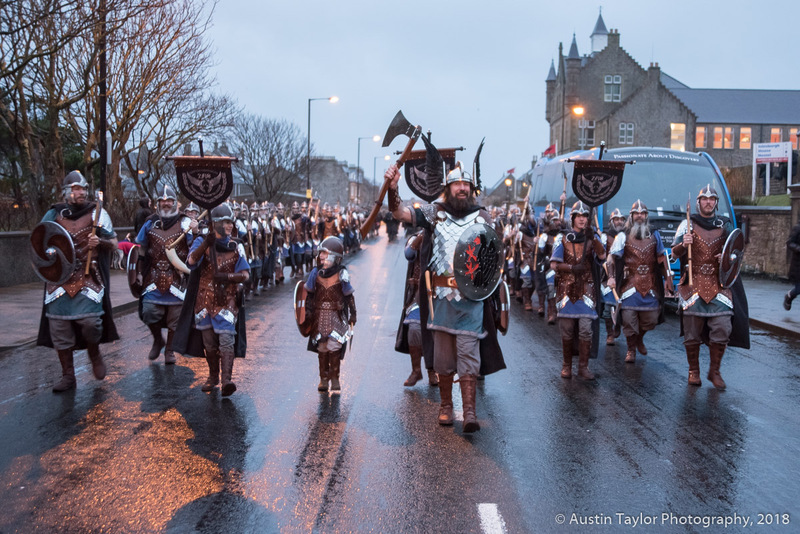 The convener gave Jamieson the customary freedom of Lerwick for 24 hours before initiating the traditional toast to the town of Måløy in Norway. Jamieson took to the microphone to say that “unlike the town centre, I’m not getting the hump” after Bell’s quips about him – a reference to the controversial traffic calming measures introduced last year. He said his squad formed back in 1960 before his dad joined a year later – while he paid tribute to John Anderson who was there for his 50th year. Jamieson gave a toast to absent friends before ending his speech by thanking all those involved in making the Lerwick event happen, from the council and the police to the Red Cross and the many ex jarls. “I did it!” he laughed with relief – leading to a chorus of cheers from the audience. 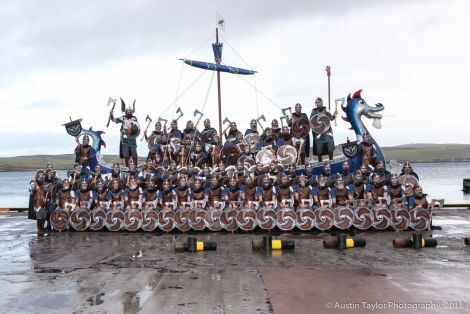 The jarl squad then headed out to visit schools, Gilbert Bain Hospital, care homes and the museum ahead of the torchlight procession at night and the subsequent liver-bashing hi-jinx at halls across the town which will run through to the not so early hours of the morning.